In Vilnius, we'll be staying for 3 nights at the Kempinski Hotel Cathedral Square. Located in the heart of the Old Town in front of the Gediminas Tower and close to Saint Anne's Church and the Palace of the Grand Dukes of Lithuania, the hotel was built 100 years ago and has recently been totally renovated. The hotel offers such upscale amenities as an indoor swimming pool, fitness center, spa, Finnish and steam saunas, Turkish bath, and an on-site restaurant serving Nordic inspired fine dining, as well as a sophisticated bar and lounge. The 96 luxury rooms are elegantly decorated with pastel interiors, wood furniture and subtle lighting, and feature free Wi-Fi, air conditioning, satellite TV, in-room safe, coffee and tea-making facilities, and marble bathrooms with a separate bathtub and shower. 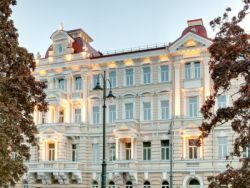 In Riga, we'll be staying for 3 nights at the Grand Hotel Kempinski Riga. 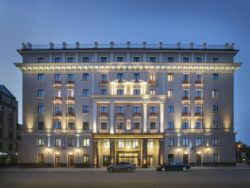 Located in the heart of the capital, just across from the National Opera House and within walking distance of the Dome Cathedral, the Old Town and the Central Market, this luxury hotel was originally built in the 19th century and features elegant marble decor. Recently renovated and brought to the highest standards, Grand Hotel Kempinski Riga boasts a bio sauna, mud room, spa treatments, fitness center, indoor swimming pool, lounge, and two on-site restaurants offering gourmet Nordic and international cuisine. The 141 classically designed rooms include a flat-screen TV, free Wi-Fi, in-room safe, tea and coffee making facilities, and bathroom with a bathtub, shower, bathrobes and slippers. In Tallinn, we'll be staying for 3 nights at the city's signature Hotel Telegraaf. 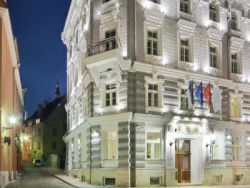 Located in the picturesque medieval Old Town close to Toompea Castle and just steps away from St. Catherine's Passage, this luxury hotel is housed in a historic building dating from 1878. The hotel features an indoor pool, hot tub, sauna, the exclusive Elemis spa, bar and lounge, and on-site gourmet restaurant offering Russian and French cuisine. The 83 rooms are elegantly appointed in a modern and Art Deco style, and feature free Wi-Fi, flat-screen TV, in-room safe, 24-hour room service, and luxuriously designed bathroom with modern amenities, upscale toiletries, bathrobes and slippers.